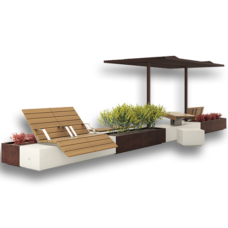 Mamuà | id created, Inc.
Mamuà is a modular bench with an integrated planter made in your choice of Pietre di Marmo or powder coated steel. To specify choose granite, white marble or black marble Pietre di Marmo. Standard finish is polished top and sandblasted sides. Select desired height: 550mm (H550 SB) or 800mm (H800 SB). Standard Anti-Deterioration treatment for concrete. To specify in powder coated steel (SB), select standard color or provide 4-digit RAL. Freestanding with plinth. Concrete Accessories: seat with or without backrest in powder coated stainless steel. Select standard color or provide 4-digit RAL for powder coated stainless steel. Add options: Anti-Grafitti treatment for concrete and powder coated steel. Zinc rich TRIPLEX primer available for powder coated steel.